Doro wat, Ethiopian comfort food. Entering the vermillion and yellow interior of Ethiopian International Café (210 Fourth St., Eureka) is like being wrapped in a flag at a soccer match. On a recent rainy afternoon, following a tip about the restaurant's outpost at the Arcata Farmers Market, we grabbed a random-couch-adjacent window table at the brick and mortar location and scanned the menu while Björk keened in the background. There is a comparison to be made between the Icelandic songstress and Ethiopian food: The less adventurous can't get past the alien/African thing but those who love it are devoted. If you are not already a fan, be brave. 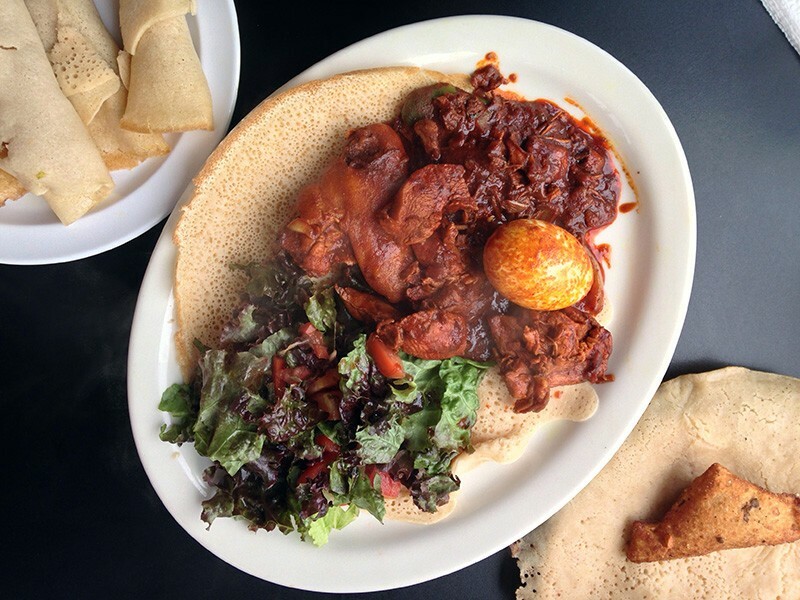 The doro wat, a deeply spicy stewed chicken ($13.25) — Ethiopian comfort food if ever there was — and boiled egg are seasoned with chilis, fenugreek and garlic. The meat falls off the bones (which you should watch out for) and the smokiness of the stew will appeal to those who love both mole Poblano and Indian curries. It comes with a generous pile of pale, rolled injera, the springy, tart Ethiopian crepes with which one scoops everything else. The sourdough-like pancakes are an acquired taste that can easily be acquired by using it to deliver a bite of meat and sauce to your mouth. Whether something so spicy really cools you off in a hot climate is up for debate, but it turns out to be just the thing on a chilly, wet day.